View More In Mixing Bowls. Polish pottery is known for its versatility in the kitchen and on the table. It is safe for use with food in the microwave, freezer, oven and dishwasher. Polish stoneware is resilient to abrasives making it durable and resistant to scratching or chipping. It distributes heat evenly for perfect baking and is also nonstick for easy clean-up, making it easy to care for. The bright patterns never fade, and are offered in thousands of variations to mix and match. It is this combination of function and beauty that makes Polish pottery so appealing. The pottery is fired in electric and gas kilns at temperatures exceeding 2200 degrees Fahrenheit. This results in a stoneware that is meant to resist aging and provide lasting beauty that stands the test of time. Polish stoneware is lead and cadmium free. Polish Pottery is hand crafted and hand painted in the Boleslawiec region of Poland. This region is famous for its naturally found white clay which artisans have used for centuries to craft this durable and beautiful stoneware. Each piece of pottery is carefully formed and painted by hand to ensure that exceptional attention to detail is paid to each piece. The most beautiful and intricate patterns are called UNIKAT patterns. These patterns bear the artist's signature. 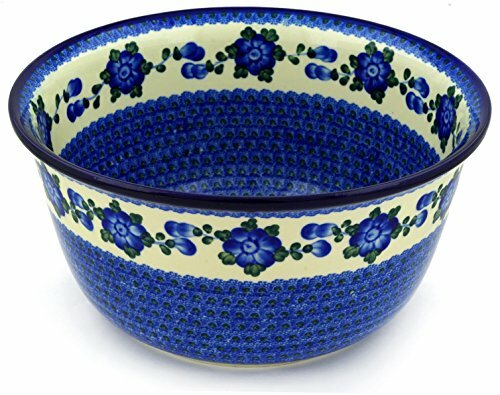 If you have any questions about this product by Polmedia Polish Pottery, contact us by completing and submitting the form below. If you are looking for a specif part number, please include it with your message.